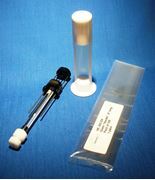 The system utilizes a special adapter that screws onto the base of a removable needle syringe and accomodates a special glass "needle". The 8" long "needle" fits easily into the ID of the 1.7mm capillary. The "Needle" Guide helps funnel the "needle" into place. The approximate volume at 7" height is 40ul. 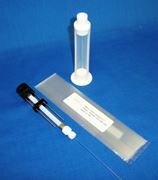 The "needle' is filled by displacement so the sample never reaches the syringe thus avoiding cleaning of the syringe and possible cross-contamination. Tests have shown about 90% recovery. Results may vary. 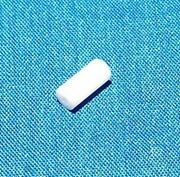 The Syringe and Repeating Adapter may be purchased separately. 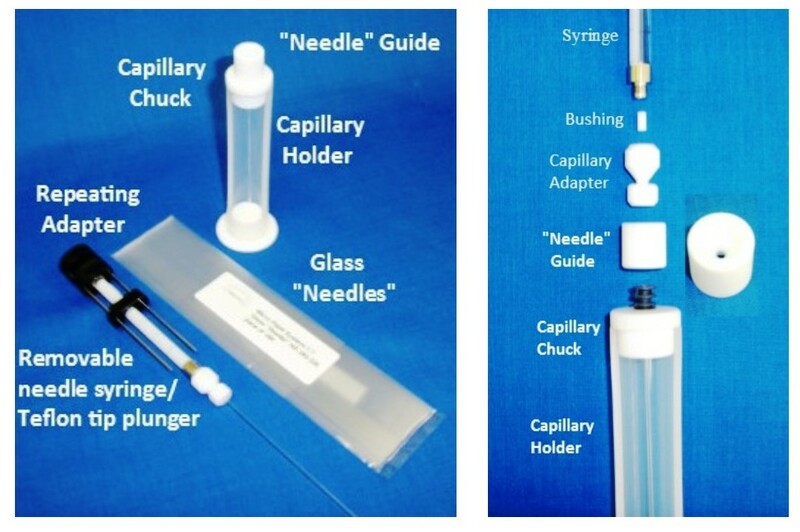 Syringes with a removable needle (50 or 100ul recommended) and a Repeating Adapter (useful in setting volume and avoid over drawing sample). These items are commercially available or can be supplied upon request at additional cost. These parts are included in some of the items listed below.